Most students in high school would rush and get a pencil or pen and write the equation if they see word problems such as Problem 1. I’m sure many of you will do the same. But you should really stop wasting lead and ink because problems such as this can be solved mentally. Many are poor in mental math because most of us did not develop the habit of solving the problem mentally first, before getting a pencil and paper. Most of us, and our high school teachers too, are so obsessed and always in a hurry to write “let x = something” when we see word problems. If you want to be a good problem solver, the pencil and paper (and other tools) should be the last resort. Before getting a tool, try solving any problem in your head first. Before you get excited, take 3-5 minutes to solve Problem 1 in your head and see if you can get the right answer before you continue reading. One number is 3 more than the other. Their sum is 45. What are the numbers? Now, let’s solve number word problems mentally! First, we have two numbers. One is 3 more than the other. So, if the first number is, for example, 18, the other number is 18+3 which is 21. This means, that if we subtract 3 from the larger number, then they will be equal. Facts: two numbers, sum = 45, one is 3 greater than the other. If we subtract 3 from the greater number, the two numbers will be equal. If we subtract 3 from the greater number, their sum will also decrease by 3. I’m sure you can do 45 – 3 in your head. Now, we have sum = 42. Now, that we have subtracted 3, the numbers are equal with a sum of 42. Well, we just divide 42 by 2 since the two numbers are equal. 42/2 = 21. So, the smaller number is 21, and the larger number is 21 + 3 = 24. Check: Is one number 3 more than the other? Yes, 24 is 3 more than 21. Is the sum 45? Yes, 21 + 24 = 45. The sum of two numbers is 87. One is 5 more than the other. What are the numbers? The sum of two numbers is 53. One number is 7 less than the other. What are the numbers? This problem is quite the same with Problem 1. The only difference is that the other number described is less than the other number (not more than). Still, we solve mentally. Facts: two numbers, sum = 53, one number is 7 less than the other. If we add 7 to the smaller number, the two numbers will be equal. If we add 7 to the smaller number, the sum will also increase by 7. I’m sure 53 + 7 can be calculated mentally. The new sum is now 60. Now that we have added 7 to the smaller number, the two numbers are now equal. So, we divide the sum 60 by 2 which is equal to 30. Therefore, the larger number is 60/2 = 30. We subtract 7 from 30 to get the smaller. Now, 30-7 = 23. Check: Is 30 + 23 = 53? Oh yes. Is one number 7 less than the other? Yes, 23 is 7 less than 30. Try solving mentally: The sum of two numbers is 71. One number is 9 less than the other. What are the two numbers? If you get this, that’s two coffee. One number is twice the other number. Their sum is 45. What are the numbers? To solve the problem above, consider the analogy. 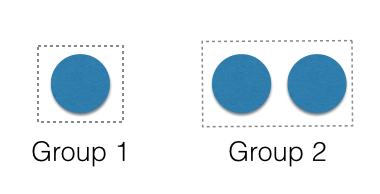 If a group of people can be represented by a circle (Group 1), then a group which is twice its size can be represented by two circles (Group 2). This means that the people can be divided equally into three groups. So, we divide 45 by 3 which is equal to 15. The number twice it’s size is 30. Check: Is 30 twice 15? Yes. Is the sum 45? Yes. Try solving mentally: One number if thrice the other number. Their sum is 44. What are the numbers? The three examples above show that many of the word problems that many of us usually fear are not that difficult at all. I think a change of perspective and a lot of practice will help us solve these problems faster and more accurately. Note that many problems are really number problems in disguise. For example, the following problems can be solved mentally because they are the same as Problem 1. One log is cut into two. One is 3 meters longer than the other. Their total length is 45 meters. How long are the logs? Susan is three years older then Mary. The sum of their ages is 45. What are their ages? Jack and Jill together have 45 dollars. Jack has 3 dollars more than Jill. How much does each of them have? See, if you can solve the problems such as the three examples above, you can really solve a lot of problems. My advice is practice, practice, and more practice.